Welcome aboard the Charter Boat Huntress. Located in Destin Florida, the heart of the Emerald Coast, known as the Worlds Luckiest Fishing Village. Your Deep Sea fishing adventure starts at Harborwalk Marina next to the Lucky Snapper Resturant 1/4 mile east of the Destin bridge. The Huntress is a 40' Infinity Fiberglass Sport Fisherman, U.S. Coast Guard approved up to 6 passengers, air conditioned cabin, clean restroom, friendly crew, fast, and well equipped with the latest marine electronics. Captain Mike Graef has been fishing Destin waters since 1989 and he and 1st mate Craig Davis (aka Groovy) will make your fishing experience one to remember. We cater to Families and diehard fisherman! We specialize in 4-15 hour charters including bottom fishing for Grouper, Snapper, Amberjack and Trigger, sight fishing Cobia and Tarpon (seasonal), Trolling for King Mackerel, Blackfin Tuna, Wahoo and Bonita. We also offer shark fishing trips. All dead bait, tackle, ice and licenses are provided so just bring whatever you want to eat and drink. 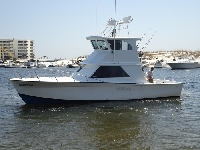 The Huntress is entered in the 61st annual Destin Fishing Rodeo October 1-31st 2009.